An assortment of items were left at the race – towels, goggles, etc. These are now at the Homestead Aquatic Center lost and found. We also have someone’s series prize from last year (grey hoodie). Please contact us if this is yours! Results are posted for Chapel Hill race! Thanks to everyone who came out to race today. It was a little chilly at the start but turned out to be a beautiful day. Results are now posted. Congratulations to all of our finishers! T-shirt deadline is Sunday, April 16th! You must register by Sunday, April 16th at midnight to guarantee your T-shirt size. Everyone will get a shirt but we can’t guarantee sizes for kids who register after this date. Thanks! Homestead Aquatic Center will re-open on April 17th! If you were waiting to register for our May 7th Chapel Hill race, don’t worry, the pool will be open! We’ve extended the deadline for the price increase through April 10th! Register now! Registration for May 6th youth clinic now open! Registration for our youth triathlon clinic and course walk-through is now open. This is ideal for kids racing for the first time at the Tar Heel Youth Triathlon on Sunday, May 7th or for kids who just need a refresher or want to see the course. Learn what to bring, how to set up transition area, see the pool, and ride and run parts of the course. Go to the clinics page to register. Limited to 15 kids max. Registration for Briar Chapel opens February 1st! Registration for our Briar Chapel race opens February 1st! Race date is Sunday, August 27th and is the USA Triathlon Mid-Atlantic Youth Regional Championship!!!! 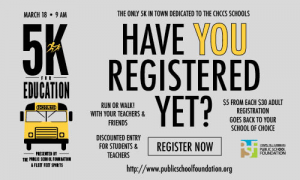 The Public School Foundation’s 5K for Education – the only 5K in town dedicated to Chapel Hill schools, teachers, and students!! Registration is open online until March 16. 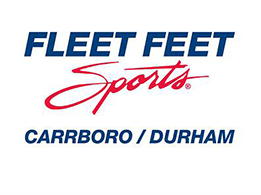 Registration at Fleet Feet Carrboro on March 17th 12-6 and at the race 7:30-8:30am. Packet pick up is March 17th at Fleet Feet Carrboro 12-6PM. Girls on the Run needs coaches! Attention parents: One of our beneficiaries, Girls on the Run of the Triangle, is looking for volunteer coaches for the spring 2017 season. Coaches are the lifeblood of GOTR and provide so many girls with positive experiences through their work and dedication. This is an incredibly rewarding experience in so many ways. If you are interested, please message me through our contact page or email joanna@kidstrinc.org. Many thanks!! Series prizes (hoodies) are in!!! Hoodies are in and will be ready for pickup at Fleet Feet Durham starting TOMORROW, December 1st. You should have received an email with instructions if you are a series winner. We are asking anyone who lives reasonably close to Fleet Feet to please pick up their hoodie by December 8th in order minimize shipping costs. We will start mailing them out after December 8th. Thank you for your patience! They look great! Attention 2016 series award winners! The hoodies have been re-ordered. Under Armour was sold out of the ones we had planned on and I was not satisfied with the alternatives they offered so Fleet Feet has been able to order them from Nike. I’m told they will be in next week and then will need to be printed with the race logo. Will keep you posted.